MSRP: $39.24 from a dealer on E-bay in the UK. Way overpriced by my opinion. PZL.46 Sum (sheatfish) was a projected light bomber of the Polish Air Force before World War II, which did not proceed beyond prototype stage. The PZL.46 Sum was designed by Stanisław Prauss in the PZL works as a successor to the standard Polish light bomber and reconnaissance plane, the PZL.23 Karaś, also of Prauss' design. First sketches were made in 1936. In order to test new features, like double tail fins and a retractable underbelly bombardier gondola, a single modified PZL.23, designated PZL.42 was built and tested in 1936. The first prototype of PZL.46 Sum flew in August 1938. It shared only a general composition with Karaś, its fuselage was much more aerodynamically refined and its wings had thinner profile. Initially it was intended to use retractable landing gear, but since the Polish industry did not produce retractable landing gear, a fixed one was used. In November–December 1938 the prototype was shown at the Paris Air Show. In May 1939 the second similar prototype was flown (PZL.46/II). Tests proved, that Sum was a successful design, with much better performance, than Karaś. The only major faults were with a mechanism of retracting of the underbelly gondola (the gondola for a bombardier, with a machine gun at the rear, was a feature copied from Karaś, where it was a fixed one. It was rare feature in light bombers' construction and its usefulness was questionable, as it reduced performance). In March 1939 the PZL.46 was ordered for a serial production. The Polish Air Force planned to buy 160 aircraft in a variant PZL.46A. The first aircraft were to be delivered in early 1940. Only some parts were produced by the German invasion of Poland in September 1939. The third prototype was in construction in the summer of 1939, it was to be an export variant PZL.46B, powered with Gnome-Rhône 14N21 engine. Bulgaria, using PZL.43 Karaś bombers, showed an interest in the new design and made a preliminary order for 12 aircraft, uncompleted due to war. Broplan was a model company based in Gdansk, Poland. I don't know if they exist anymore?? The kit came in a sealed cello bag that contains 2 chalk-white vacuformed sheets, clear vacuformed canopy and the instructions. There are no decals included in this kit. The instructions consist of a single sheet printed on one side in 12" x 17 1/2" format, folded three times to fit the bag. 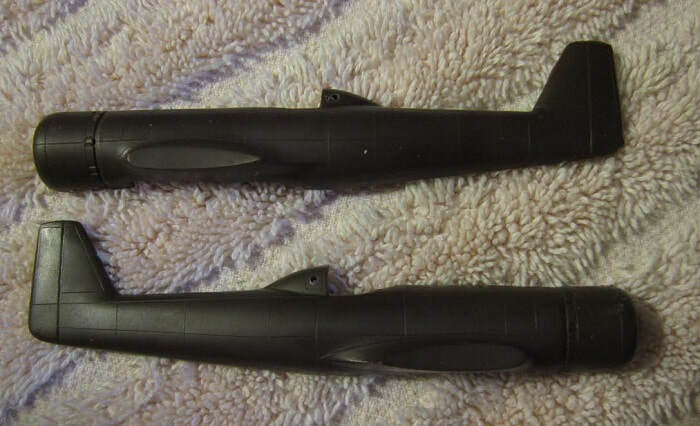 All are listed as being 1/72nd scale and I assume all vacuformed. No kit numbers are provided for them. 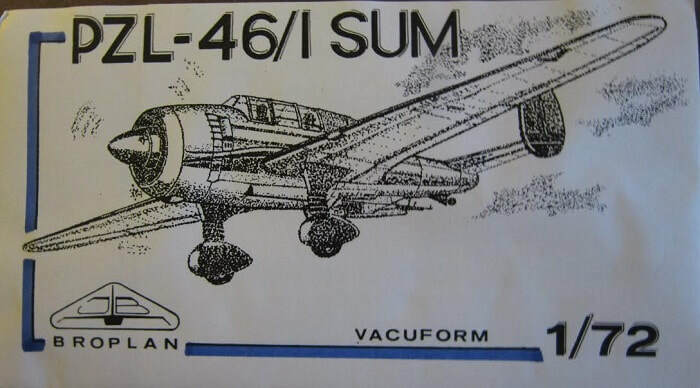 The right side of the sheet has a profile of the PZL-46/I shown in olive-drab over a light-blue undercarraige, with no markings what-so-ever, over the parts trees illustrations and an exploded illustration for assembly purposes. The reverse side of the sheet is blank. The first sheet contains the fuselage parts. engine, tail and fuselage decking. 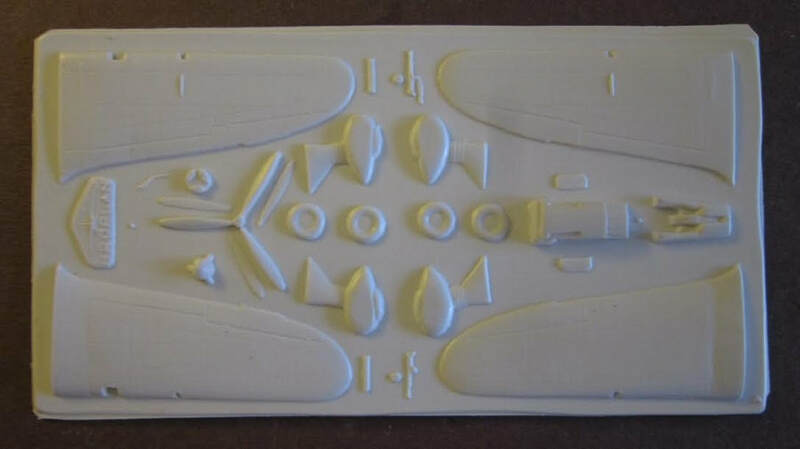 The second sheet has the upper and lower wings, fixed landing gear and wheels, propeller and interior parts. The last sheet contains the canopies. ​I am no fan of vacuformed kits. They take too much work to cut the parts out, assemble them with a lot of putty usually needed and then the result is mediocre at best. Give me a injection molded kt any day of the week. I am willing to peddle this kit for a decent offer plus postage. I got this kit unsolicited from a model that I traded with years ago in Krakow, Poland. I told him I did not like..or want the darn kit and that I would return it to him. He said to keep it.